When it comes to having a beautiful and healthy smile, it takes active participation and a willingness to make your oral health a priority. Beautiful smiles do not just happen, yet millions of Americans treat their oral health as if they do. Flossing daily and brushing at least twice a day are both essential for a healthy smile, as well as visiting the dentist twice a year for a thorough cleaning and exam. For those who need a little extra help, your dentist can offer treatments to help protect your teeth between visits. Fluoride treatments have been used by dentists for decades to help protect children’s and adult’s teeth. Fluoride is naturally derived from the compound fluorine, and it has long been known for it benefits to oral health. Fluoride helps to strengthen the tooth enamel and make it more resistant to the harmful effects of oral plaque. Plaque is caused by acid-producing oral bacteria that live inside the mouth. Plaque is the sticky, white substance that forms on the teeth each day, and when not removed by flossing and brushing it will build up and eat through the teeth. Fluoride treatments provide a barrier of protection against the effects of plaque. Once the teeth are thoroughly cleaned during a dental visit, fluoride can be applied directly to the teeth. 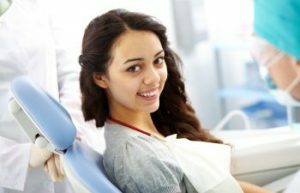 This is a quick and painless application that offers benefits of cavity prevention for up to a year. Children who are just learning to care for their teeth and adults who are more cavity prone or who suffer from gingivitis, or who neglect their oral hygiene, can protect their teeth from decay. Contact Dental Care Center at Kennestone to learn more about how you can protect your smile with fluoride treatments. You only get one smile – care for it well!